Pharamond (also spelled Faramond); or The History of France is Gaultier de Coste, Seigneur de La Calprenède's last historical romance, begun in 1661 and left incomplete at the time of his death in 1663 at only the seventh volume. The text was continued by De Vaumoriere, but was never completed, the 12th and final volume being published in 1670. Set in Gaul, near Cologne, during the fifth century, Pharamond is the first work to attempt the nation historical novel in France and seeks to give an account of the rise of the French monarchy. The novel's hero, Pharamond, is the first King of France, believed at that time to be a historical figure, but now understood, as Spire Pitou explains, as a "purely legendary figure" (24). The text features characters of a number of different nationalities. 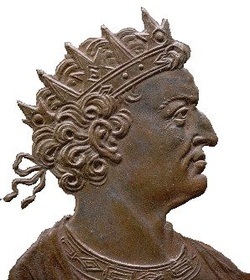 Pharamond: Leader of the Frankish army and the first king of France. He is in love with Rosemond. He is described as of strong character, generous, honest, dependable, modest, and capable of great physical accomplishments (Pitou 112). Rosemond: Daugher of the King of Cimbres. Marries Pharamond after fiercely refusing him when his behavior did not meet her standards. La Calprenede provides detailed but often stereotyped descriptions of his heroines, focusing on beauty, proportion, and bearing for Rosemond (Pitou 112). Balamir (Theobalde): The true brother of Rosemond and son of the King of Cimbres. He is called Balamir until his identity is revealed, when he is recognized Believed to be the son of the King of the Huns. He is in love with and eventually marries Hunnimonde. Described as steadfast, knowledgeable about literature, and athletic. He is also said to have a strong sense of justice (Pitou 112). Mundisic: Brother to Balamir, true son the the King and Queen of the Huns. He kidnaps Hunnimode. Described as lacking Pharamond's modesty and equanimity (Pitou 112). Placidie: In love with Constance, but angered after she find a letter in which he professes his love for her. She is forced to marry to Ataluphe and later marries Constance once Ataluphe dies. Gondioch: Pharamond's ally turned rival for Rosemond. Agilmond: In love with Gilismene. She marries his rival to have peace in the kingdom. The rival repents and returns Gilismene to Agilmond, whom she loves. Ambiomer: Charge of Amriorix, found in the forest. Very distinguished in Battle. He is in love with Amalzonthe. 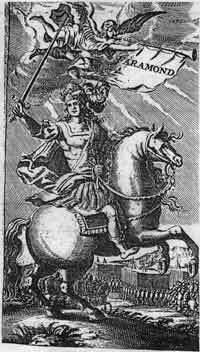 It is revealed that he is of noble birth and he married Agelmode's sister, Agione. Like La Calprenenède's other romance's, Pharamond is comprised of one main plot, a few important sub-plots, and a number of smaller plots that have little bearing on the main story and function as vehicles for more histories to be told (Pitou 73). The main plot of the novel follows Pharamond, king of France, and his love, Rosemond, daughter of the King of Cimbres. Pharamond, seeking to help his ally Gondioch win the hand of Rosemond (who has refused Gondioch), upon seeing her instead falls in love with her. Rosemond refuses Pharamond because he killed Vindemir, the man her father had intended her to marry. Pharamond's killing of Vindemir also results in an attack against him by the King of Suèves, ally of the Cimbres. Rosemond's father, the King of Cimbres, fakes a kidnapping of Rosemond in order to manipulate Pharamond, whom he correctly assumes will try to save her. Pharamond accidentally kill's Theobalde, Rosemond's brother, in trying to save her and is going to kill himself until Rosemond orders him not to, so that she might kill him in battle. Rosemond in the mean time has attracted a number of suitors, all of whom Pharamond defeats. On his death bed, the King of Cimbres orders Rosemond to seek revenge against Pharamond, which she agrees to, and subsequently becomes Queen. The war between the King of Suèves and Pharamond continues until Constance intervenes and enables a truce. The conflict is solved however, when it is revealed that Briomer had switched his son with the King of Cimbres son when they were young, revealing that Pharamond did not kill Rosemond's real brother, but Briomer's son who grew up in his place. The story of Rosemond's actual brother, Balamir (who later goes by her birth name, Theobalde, after his lineage is revealed), is one the of work's major sub plots. Balamir, believed to be the son of the King of the Huns, and his brother Mundisic, both fall in love with the Daughter of the Queen of the Goths, Hunnimonde. Mundisic, jealous of Hunnimonde's favor for Balamir and Balamir's success in battle, kidnaps Hunnimonde and threatens to kill her should Balamir attempt to rescue her. Dejected, Balamir seeks death in battle, instead eventually falling in love with Rosemond. Meanwhile, the King of the Suèves breaks the truce arranged by Constance, driving Balamir to join Pharamond, believing him more honorable. Hunnimonde escapes (and is kidnapped and escapes again) and is eventually reunited with Balamir (the real Theobalde). The two are married after is is revelaed that Balamir's feelings for Rosemond became brotherly once his true identity was revealed (Pitou ). According to Pitou, La Calprenède mostly likely referenced important works of both French and Roman history in crafting his account of the history of the French monarchy. Pitou also cites a number of literary sources that La Calprenède may have used, mostly from the classic and neoclassic epic, the Greek Romance, and the Medieval Romance. See the Pharamond Textual References page to learn more about the use of this romance in Charlotte Lennox's novel.